Halco cleans air ducts and seals air leaks for maximized energy efficiency, as part of a program designed to save you up to 40 percent on your heating and cooling bills. We'll inspect your ductwork as part of our free ductwork estimates. We service Syracuse, Ithaca, Rochester in New York. Between both types of ducts, the air is cycled continually until your thermostat tells the furnace or AC that the right temperature has been achieved. If you're ductwork isn't up to par, this will cause your HVAC system to run longer, wasting energy and causing utility bills to rise. Halco offers duct repair and sealing to fix any leaks or gaps that might be leading to the inefficiency of your ductwork system. Contact us today to schedule your Free Estimate for ductwork in Rochester, Ithaca, Syracuse, Webster, Auburn, Fairport, Pittsford, Cortland, Canandaigua, and more! Making sure your ductwork is the proper size and installed properly is key to having an efficient heating and air conditioning system. We specialize in energy-saving improvements, including ductwork repair and HVAC service in NY. Indoor Air Quality: If you have leaks in your return ducts, you may be sending "bad air" directly into your living space, where the system runs. You wouldn't want to breath air from your crawl space all day long, but if you have an uncontrolled leak, you may be doing just that. Leaky ducts may also create "pressure imbalances" that keep some rooms under positive pressure and others in a slight vacuum. If this happens, you may have unhealthy air (laden with dirt, dust, pollen, allergens, and other contaminants) sucked into your home. 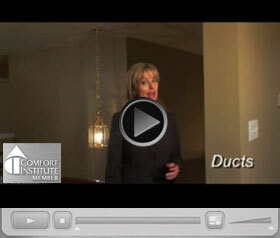 Our duct cleaning services can help get rid of unwanted pollutants in your ductwork. Jeff's immediate response and efficient work is much appreciated. Jeff also has a great demeanor and respect. Thanks! Thom seemed very knowledgeable & was able to focus on the problem & fix it. Hi Todd. I think everything turned out great. The guys must have had the system running for a while because when I came home the house was nice and cool. No musty smells and everything in the basement was very tidy. I'm glad I chose Halco and very glad I had new ductwork installed. The guys told me the old duct work was lined with fiber glass and we have been breathing that in for over 20 years. Put the mice running through there and it was really foul. You would be surprised how many contractors DID NOT want to install new duct work. I already caught one mouse in a catch-and -release trap and let it go outside. Now they have no way to get back in. Almost forgot; thrilled with the masonry work. I'll mail in the questions you left for me and thanks again.. Halco rules! Thanks, Dan. This was a VERY difficult and dirty job. Eric arrived on time, prepared the work area quite well to minimize debris, dirt, etc. His attitude throughout the job was pleasant, positive and professional; this in spite of the fact he had NO help till afternoon. He could have given up on one or two parts of the job that looked impossible; but he was determined and found a way to get it done. Quality of the work was excellent as far as I could see. He took no "short cuts" and did it right .... actually rectifying an air-flow deficiency created by the original Halco installation. We would be very pleased to have Eric return on any future service calls. He is a good ambassador for Halco. Jim gave me good advise on having my ducts cleaned and on central air. The Halco Team headed up by Mike T. did a great job. They were friendly and certainly knew their work. I would recommend them highly. For a free HVAC air duct estimate to assess your home's ductwork energy efficiency and to see if air duct sealing will work for you, call or contact us online. Halco helps homeowners save energy! We service New York including Syracuse, Ithaca, Rochester, Penfield, Geneva, Brockport, Hilton, Spencerport and more. Call 1-833-844-2622 or contact us online to schedule a free home inspection and heating and cooling estimate or a no-cost energy assessment in NY. We can also upgrade your HVAC system with a high-efficiency air conditioning unit or even a geothermal heat pump! We specialize in energy improvements for the whole house, including tankless water heaters, home insulation, window and door placement, as well as plumbing and electrical services. Contact us today to learn more about how we can help you save money and energy!